John Banvard, 100, and Jerry Nadeau, 72, are military veterans, and served in World War II and Vietnam, respectively. When they met in 1993, they were “sort of in the closet.” John’s wife of over 35 years had died nearly a decade prior and he had never been in a serious relationship with a man. Neither had Jerry. 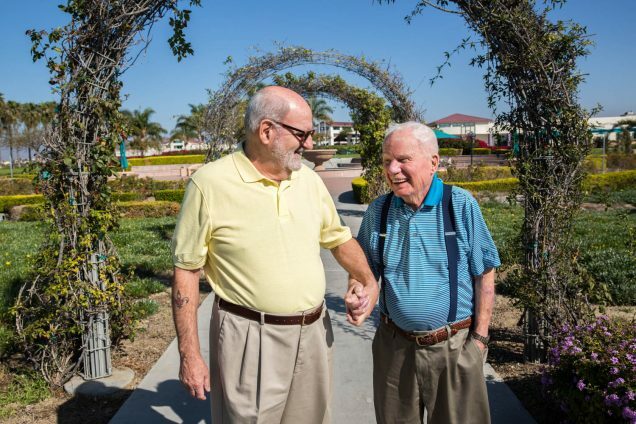 Today, they live together in a senior home for veterans in Chula Vista, California — just a few miles south of San Diego, where they were married in 2013. Top photo: John Banvard (L) and Jerry Nadeau at their home in Chula Vista, CA. Bottom photo: Jerry Nadeau (L) with John Banvard outside their home in Chula Vista, CA. Originally aired February 09, 2018 on NPR’s Morning Edition. JN: So I start with my name and all that stuff? Okay, we’ll see how it works. Hello! My name is Jerry Nadeau. I’m with John Banvard. JB: Hello. My name is John Banvard. I am 100 years of age. JN: When I first met you, John, you were 75 years old. What would it have been like if you didn’t meet me? JB: I would’ve continued being lonely. I’d been absolutely lost. JN: When we met, we were sort of in the closet. JB: I was expecting we’d be ridiculed and there was very little of that. JN: We got married at the veterans home and we said, ’If you came to see the bride, you’re out of luck!’ [Laughs] Do you remember that? JN: It was very informal. JB: It was done simply, yes. JN: We served hot dogs. JB: Which is hardly wedding food! JN: Remember, John, I was with you in the cafeteria and somebody came up and they were with their family and they said, ’Oh, this is Gerard Nadeau and this is his husband, John.’ I had never heard that before. JB: Yeah. That was very nice. JN: You’ve made my life complete. JB: I could say the same thing to you. I think we’re probably as happy together as any two people you’re likely to meet.